definitely useful if you can get your paws on blacker yarns from the uk, or can find the mainly uk wools in order to spin for the patterns. the information on the wools and yarn properties and what they're best used for is interesting, but i find so many patterns could definitely benefit from charts - or in some cases charts that didn't require a magnifying glass, as many don't have them or at least better photos or close-ups of detailed stitches. many of the patterns are also a bit, i guess a good word would be 'dated', as if it isn't super simple and basic often it looks like something nobody my age would ever wear or have a need for. i understand the desire to want to avoid anything trendy but well-fitting basics would have been a good idea, so perhaps pattern writers that might have not all been senior citizens would have been nice. WAY too many vests and waistcoats too. 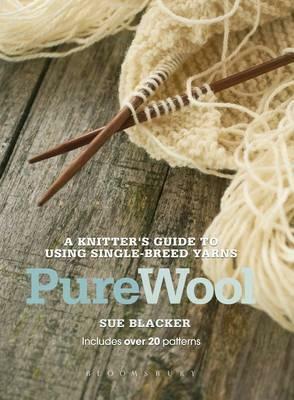 i like the yarn selector at the back, but after reading it the book feels more like an advertisement for blacker yarns than anything else, and all this information as well as many of the patterns are available for free on her website where one would go to purchase her yarn. I love the writing in this book and love the subject matter. I wish the patterns were designed in larger sizes for women who have larger than a 42 inch bust. I also wish there were references for where to find the patterns for some of the model sweaters.